MoMath brings its popular Volumes book club to a younger audience. Like to read? Like math or wish you did? Come to Tween Primes, the MoMath book club for tweens and teens (ages 10-15). Pizza and good math reads: what better way to spend an evening? 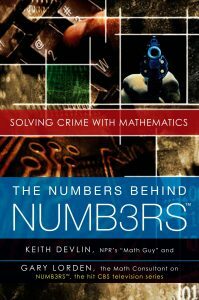 Using the popular CBS prime-time TV crime series NUMB3RS as a springboard, Keith Devlin (known to millions of NPR listeners as the Math Guy) and Gary Lorden (the principal math advisor to NUMB3RS) explain real-life mathematical techniques used by the FBI and other law enforcement agencies to catch and convict criminals. From forensics to counterterrorism, the Riemann hypothesis to image enhancement, solving murders to beating casinos, Devlin and Lorden present compelling cases that illustrate how advanced mathematics can be used in state-of-the-art criminal investigations. Note: this is a drop-off program.